This is a wonderful yet simple way to prepare sea bass using your grill. 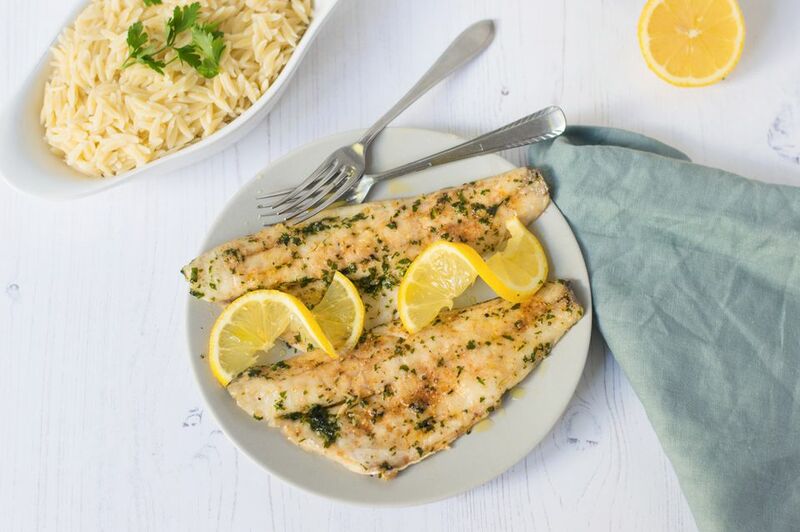 The garlic butter sauce blends nicely with the mild flavor of this light and tender fish. Serve the grilled sea bass with rice and grilled vegetables for a complete meal. There are two kinds of fish you will see called sea bass. The first is the Atlantic sea bass, which is harvested in the western Atlantic Ocean. These fish are often sold as whole fish of up to 2 pounds. You want to buy fish that have a deep black color and pink gills. They can be enjoyed in the same ways you would cook snapper or cod. Chilean sea bass is not a bass at all—it is a marketing term for the Antarctic toothfish or Patagonian toothfish, which is a type of cod. It has a very mild flavor and buttery texture. Once a by-catch, now it is prized as by chefs as a blank slate to which they can add flavors. To prepare the butter sauce, combine butter, lemon juice, garlic, and parsley in a small saucepan. Remove the pan from the heat once butter has melted. Preheat your grill for medium-high heat. Right before placing the fish onto the grill, make sure to oil the grill grates. This can be achieved by using a large pair of tongs, folded paper towels, and a high smoke point oil (canola oil, peanut oil, sunflower oil). Olive oil will work in a pinch. Dip the paper towel into oil and run across the grates at least three times to create a non-stick surface. This will keep the fish from breaking during the cooking process. Combine the onion powder, garlic, paprika, pepper, and salt in a small bowl. Sprinkle the seasoning mixture on both sides of the fish. Place the fish on the grill and cook for 7 minutes. Turn the fish and coat it with the butter sauce. Cook for about 7 more minutes. Once the fish reaches an internal temperature of at least 145 F, remove it from the heat, drizzle it with olive oil. Serve it with your favorite sides and enjoy! If Atlantic sea bass is trap-caught or caught on a handline, it receives a "best" eco-rating by the Monterey Bay Aquarium Seafood Watch. However, most black sea bass is trawl-caught and it receives an "avoid" eco-rating. Chilean sea bass receives an OK eco-rating, but only if you buy fish eco-certified by the Marine Stewardship Council and sold by a Seafood Watch partner.